There is always a desire, a yearning, for something better. Not just for themselves but for a better way of life for others as well. Very creative. The author, D. H. Lawrence wrote in a very socially conscious but romantic way. Many of the children he grew up with would have died in early adulthood from lung disease in the mines. One of his ideals was to live on a utopian island, to live in a community with like minded friends. At the end of a very creative life he died of consumption. The expression, the creativity, kept him healthy and as that ended the pathology came on. Chopin wrote giant romantic canvases and coughed up blood over the keys as he played. The young artists (George Orwell and others) going to the Spanish Civil war, the exodus of the young from Ireland and the fact that the young Irish men (and women) traveled to the far ends of the world to set up new communities; all this is driven by the tubercular diathesis. Their main driving force is not financial wealth but more in the health and well being of themselves and others others. The 1947 Labour government in UK nationalised the hospitals, the schools, the trains but not the banks, meanwhile the Sycosis of the French government did see the banks come into state and community ownership. It is pertinent to look at the social conditions that prevail when TB is on the increase. The chart shows increases in UK in 1923-28. This was the time of the national strike; a great divide between rich and poor. Again 1943-49 similar poverty divisions as the war dragged on and the poverty after resulted in rationing. Then there has been a steady increase since 1989 and over this period there has been a widening of the gap between rich and poor. So the factors affecting TB are poverty on the one hand but unfair distribution on the other. 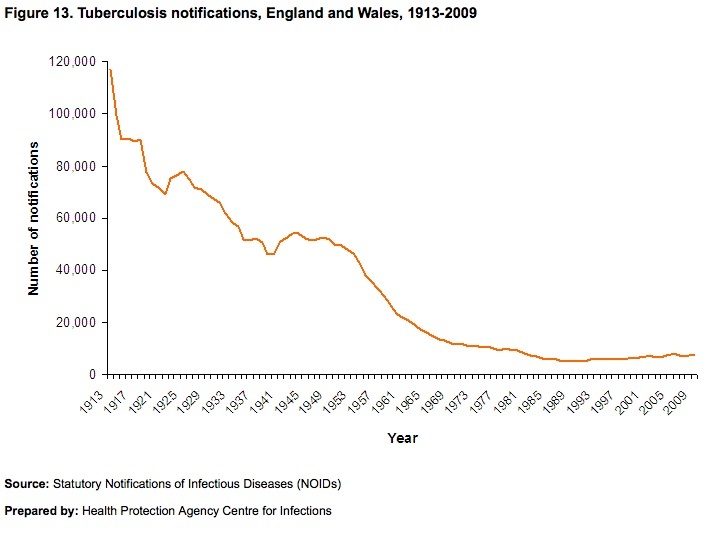 There was much poverty still around in the 1950’s but the gap between rich and poor was narrowing and TB was abating. The conditions for TB are increasing impoverishment. Here we have looked at poverty in forms of financial wealth but any impoverishment, especially of spirit can predispose a community or individual to TB. On and individual level they get very excited about a new job but soon they feel there is more and want to move on, similarly they get infatuated with a new romance and then it blows over. They feel there is SOMETHING BEYOND. They live their life in a crescendo WITH A DEEP SENSE OF UNFULFILLMENT. They need their expresion, value their art but with every crescendo there is a diminuendo. It is this discontent that leads to pathology. The adolescent with the ‘unsuitable’ boyfriend who is banned from seeing him builds up a romantic picture. They want to run away they cannot tolerate the now. This shows in the Rubric: ‘desire to travel’ or ‘cosmopolitan’. They drive themselves hard, become emaciated and get ‘colds’ three or four times a year. Poor concentration. Teenagers who won’t do homework. In infants these ideas are expressed on the physical side as a constant runny nose and on the emotional side as the familiar temper tantrums. The temper tantrums are differentiated from CALCAREA CARBONICA by their desire to run away (CALC hangs on to you – clings to your leg in the kitchen) and PULSATILLA runs away and comes back. It is the first remedy to think of where there are midline abnormalities. (In the early development of the foetus the flat cells form a tube around the developing spinal cord). Anomalies here later produce hydroceles, umbilical hernias and cleft palate. Also children can be born with mental retardation and TUB should be added to Rubric: ‘Retardation’. Often when normal they will still develop slowly (late walking and talking) – cf. BARYTA CARBONICA which has the mental backwardness but not usually the other accompanying symptoms. Both remedies both have fear of new situations and fear of being observed. TUB children are born irritable and angry, crying and being very fussy, especially on waking. Tubercular children born placid develop these traits and need discipline and even punishment. IRRITABLE CONTRARY DESTRUCTIVE, EARLY AND TO AN EXTREME DEGREE. They bang their heads on floors and walls. They can also curse and swear (ANACARDIUM. STRAMONIUM. HYOSCAYMUS.). They can be destructive to themselves and others. They can hit and kick their teachers and parents. Violence may begin after an acute disorder (or vaccination. Vaccination tends to push tubercular children more into the sycotic miasm – see article on DPT). They break things. Babies and toddlers who burrow their heads in the pillow, grind their teeth, irritable especially during dentition, perspire at night, long eyelashes and born with long hair on scalp and along spine. Teeth erupt too soon and are painful. They like milk. Diarrhoea accompanies many illnesses, especially lactose intolerant children who drink milk. They often loose weight with diarrhoea. They are typically born thin or plump and thin down in early childhood to become tall frail anaemic children, even if they eat a lot. It is hard for them to gain weight. Hyperactive but tire more easily than MEDORRHINUM or SULPHUR. The opposite growth pattern is also possible – stunted growth, failing to develop teeth on time or fontanellles that remain open. Fear strangers, cats, dogs, (can hate cats or have allergic reaction to them, this can be a strong indicator). Fears also include monsters, thunder, the doctor, dentist or medical personnel and examinations, both medical and otherwise. There is claustrophobia that may be expressed as a fear of being buried alive. This issue with being confined shows up in the Modalities of being worse in a close room. On all levels they need freedom to express themselves and open spaces. The very nature of mining would encourage physical tubercular symptoms. Answers monosyllabically. Breaks things that they wanted, curses, stamps feet in a rage. Holds breath until passes out (IGNATIA CALCAREA CARBONICUM). They may display an abundance of ideas. Can run away from things and this may happen suddenly, they are impulsive. This can show in their speech were they may be loquacious, or shout, or change from one subject to another. Quarrelsome, argues over trifles. They are sensitive which may be expressed with SIGHING or as oversensitive to pain. Distress out of proportion to the pain. Shamelessness in children (taking clothes off (PHOSPHORUS). Often very bright but the opposite is again possible with idiocy and slow comprehension in new situations. Often industrious but again can have aversion to work. They display ritualistic behaviour. Courtships and love letters as part of a romantic entanglement. They may go for ballroom dancing or Salsa rather than the more animal rhythms of MEDORRINUM or the individualistic dancing of CARCINOSEN. Although CARCINOSEN could manage all three. MENSES: too early, too profuse – history of very heavy periods, migraines with period, tendency to haemorrhage. Take colds easily. Emaciation rapidly, even though eats (IODUM) – use HYDRASTIS to replace weight loss after TUB. HEADACHES: Right extends to occiput. Like an iron band, School girl’s headache. worse from studying or mental exertion, meningitis. MODALITIES: better dry clear climates, better mountain air especially pine forests, sensitive to extreme heat. THUJA often precedes prescription of TUBERCULINUM and results in better effect from TUBERCULINUM. The way in which THUJA intertwines with TUBERCULINUM, pregnancy and in life is discussed more in the lecture on THUJA. Thank you. Very real and informative as well.